Loss of appetite is usually a part of the normal aging process. Our digestive system tends to worsen with age especially when it comes to our stomach. However, some stomach or digestive problems don't necessarily relate to normal aging. Rather, the stomach may actually be aging prematurely or aging faster than it should. If these stomach problems are left untreated, it can result to an increased risk of peptic ulcer and stomach cancer, which can start as early as age 30, with twice as much risk to those aged 50 and above! Of course, there's good news! There's a possible treatment that does not only help delay the aging process of the stomach, but rejuvenate it, too. In this article, we'll tell you the surprising cause of 'aging' stomach including the latest treatment available. One of the characteristics of aging stomach is thinner stomach lining, which makes it more susceptible to damage. This condition progresses rapidly, so you'll have 18 times increased risk of peptic ulcer, and 100 times the risk of having stomach cancer. In one of the case studies conducted in Japan, 50% of the participants aged 40s-60s have their stomach aging 10 years ahead than the actual age. On the contrary, people who are 50 years and older have their stomach aged younger. Another case study was conducted on an 80-year-old man and 20-year-old man to determine if regular exercise and diet have anything to do with aging stomach. It was shown that the 80-year-old man's stomach is aged above its actual age. It's worth noting that this person had a good lifestyle, taking regular exercise, and good diet. On the other hand, the 20-year-old man is not getting regular exercise, and eats mostly only his favorite meals. In other words, he does not have a good healthy lifestyle, yet his stomach is aged younger than its actual age. Based on these studies, abnormal aging of the stomach is not necessarily attributed to exercise and diet. You may think that stress could be the cause, but stress experiments also do not show any changes to the stomach at all. In conclusion, lifestyle does not cause the aging of the stomach. Gastroenterology Discovery! Stomach is Not Aging Originally!? The cause of premature aging of the stomach has been a mystery among the medical community for quite some time. It is only in recent years that the primary cause of aging stomach is discovered. This discovery does not only help get rid of the cause but rejuvenates the health of the stomach altogether. Simply put—poor lifestyle, stress, diet, and exercise do not directly affect how the stomach age. In fact, the stomach organ, by its inherent nature, does not age! If that is the case, then what kind of thing that breaks into the stomach and makes it age? Latest findings show that one of the primary causes of aged stomach and stomach cancer is "H. pylori (Helicobacter pylori)". About one-half of the world's population is infected with this stomach bacterium. This makes it the world's most widespread infection. 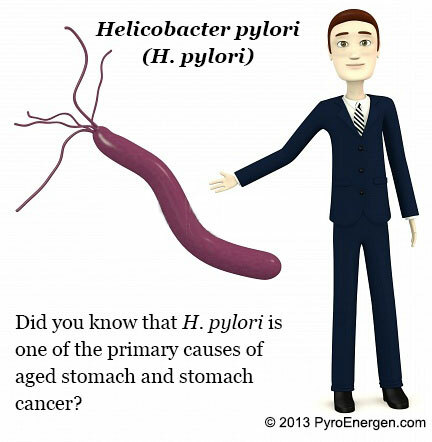 H. Pylori Infection Makes Your Stomach Lining Thinner! Because of the stomach's rapid metabolism, too much drinking and eating can easily stress the stomach's wall lining and irritate it. 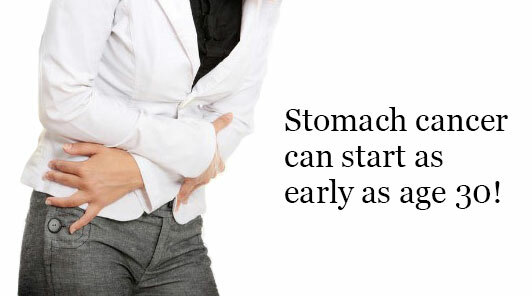 The stomach however, is capable of healing itself over the course of a few days. However, if one is infected with the H. pylori, the bacterium continues to stay in the stomach at all times. The bacterium is capable of breaking the surface cells of the stomach and making the mucous membrane thinner. In this state, the stomach won't be able to self-heal sufficiently and could eventually lead to stomach cancer and gastric or peptic ulcer. There are several methods available that can be used to diagnose an H. pylori infection. How Do You Eradicate Helicobacter Pylori? Take a one-week antibiotic regimen. 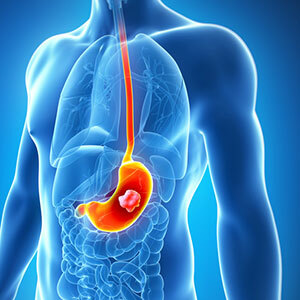 This is a standard first-line therapy that has revolutionized the treatment of peptic ulcers. You can help to successfully eradicate H. pylori infection by incorporating this modern one-week antibiotic "eradication protocols". Research shows that the risk of ulcers and cancer drops dramatically after proper eradication of H. pylori. However, if the stomach lining has already been damaged by the H. pylori infection, then it may take 4-5 years for it to recover completely. The recovery will also be slower with age. Therefore, it is recommended that the infection is eradicated as early as possible. Are there natural ways in eradicating Helicobacter pylori? Some new studies suggest that virgin olive oil may help treat H. pylori infections. However, its efficacy against the bacteria is only shown in laboratory tests. How effective it will be when it's incorporated into our diet is yet to be determined. Loss of appetite and weight loss are some of the common side effects of antibiotic therapy. Consult your doctor before taking the one-week antibiotic regimen. Do not expect to have a zero risk of getting stomach cancer after successfully eradicating the H. pylori bacterium. Regular checkup is still recommended. If you are suffering from gastro-oesophageal reflux disease (GORD), H. pylori eradication may lead to worsened control of reflux. Please consult your doctor beforehand. Another type of stomach cancer is not associated with Helicobacter pylori but is related to our theory of outside negative energy force. We highly recommend the use of the PYRO-ENERGEN electrostatic therapy in this case. 1. 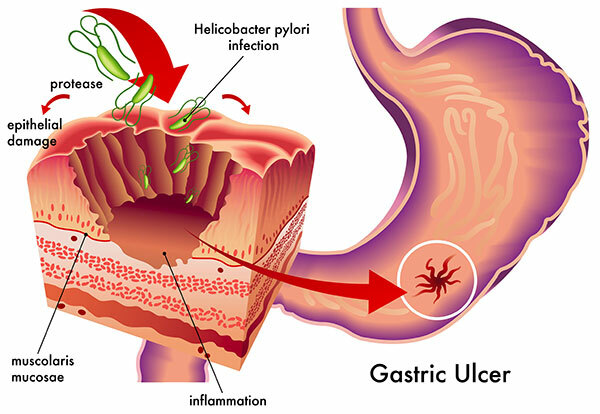 "Ulcer Facts and Its Treatment"
2. "Functional Dyspepsia (Non-Ulcer Dyspepsia)"